Proper Care of CDs and DVDs - HAVE, Inc. Whether it is a music CD, computer software, film, or file backup, you want to keep your CDs and DVDs in peak condition for as long as possible. To help you, we have compiled this list of some of the ways to protect and preserve your optical media. The scariest phrase you'll hear tossed around is "disc rot." This is where a DVD becomes unplayable due to material decomposition rather than physical damage. Causes may include poor adhesives between the disc layers, impurities in the metal, low quality resin, or improper inks. Aside from disc rot, other manufacturer-based problems can effect your DVDs: unbalanced construction (such as off-center holes or off-center paper labels), inappropriate packaging (including hub damage from oversized center mounts, warping from too-tight shrinkwrapping, chemical damage from packaging adhesives, or crush/fold damage from using incorrect mailers). At HAVE, we go to great lengths to provide our customers with products from trusted manufacturers, and our personal attention to detail helps ensure that your package is packaged correctly to arrive safely. We also conduct routine follow-ups to make sure that the manufacturers we work with provide a consistent product. Although fairly sturdy, CDs and DVDs need proper care "in the field" as well. Most people know to handle discs by their edges and center hubs rather than the data surface, but did you know that storing discs horizontally can eventually cause warpage? Or that CD jewel case holders may be too tight for long-term storage of DVDs? So make sure to store your discs "book style," and keep your DVDs in DVD cases or sleeves if they will be stored for a long time. To be read correctly, the playable surface should be kept clean and dust free. Fingerprints, dust, scratches, and other "minor" issues can negatively effect the life of your disc. You can learn more about this by reading the "Care and Handling Guide for the Preservation of CDs and DVDs" and "Quick One-Page Reference," published by the National Institute of Standards and Technology: http://www.itl.nist.gov/div895/carefordisc. 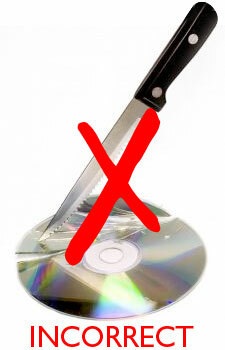 With proper care, your CDs and DVDs are sure to last for years! A Quick List of "Do's" and "Do Not's"